Gallop and trot with this elegant stick unicorn. Little riders can press its ear to listen to playful horsey sounds. 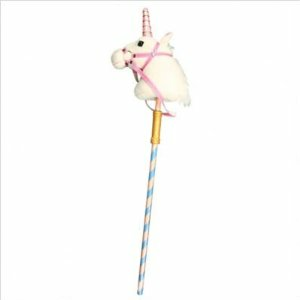 This detailed pretend-play toy features soft, shimmering fabric, hand-carved painted stick handle, and easy-to-clean reins. Excellent quality construction for years of imaginative adventure. Measures 41" x 10" x 5.5"